Doctor Wolf Makes House Calls! San Diego Home Foot Care Service is committed to providing every patient with exceptional care and personalized attention in the comfort of their home or office. Avoid the hassle of arranging for transportation and waiting for time-consuming clinic appointments, urgent care, and emergency room visits. San Diego Home Foot Care Service offers private, mobile, concierge-style podiatric medical care for the entire San Diego county. We offer extended hours for your convenience, and will respond within one hour of your call. No matter where you are, Dr. Wolf will come to you to take care of your feet. For the elderly, housebound and disabled patients who aren’t able to come to our office for treatments, Dr. Wolf will come to you to provide in home foot care services. He understands the challenges of coordinating transportation and mobility and health issues that can prevent you from getting the foot care you need. Many patients cannot reach, see or feel their feet. The inability to manage routine foot and leg problems can escalate into very serious health conditions. Dr. Wolf comes prepared for home visits with all necessary sterile instruments to handle most foot problems he would see in his office. Thickened, yellowish or discolored toenails; toenails become difficult to cut. The toenail may separate from the nail bed, and may begin to crumble. Without treatment, the condition may continue without pain, or may progress over time, resulting in nails that become so thick that they cannot be cut using conventional pedicure equipment, or in the formation of abscesses under the nail, causing pain when the patient puts on footwear or attempts activities that put pressure on the toes.Thickened, yellowish or discolored toenails; toenails become difficult to cut. The toenail may separate from the nail bed, and may begin to crumble. Without treatment, the condition may continue without pain, or may progress over time, resulting in nails that become so thick that they cannot be cut using conventional pedicure equipment, or in the formation of abscesses under the nail, causing pain when the patient puts on footwear or attempts activities that put pressure on the toes. Often the subject of jokes, athlete’s foot is no laughing matter for those who suffer from it. Almost 70% of the population will be affected at some time in their lives, although it is more common in adolescent and adult males and, generally, is not seen in children below the age of 12. Itching of the feet is thought by many to be the hallmark of athlete’s foot. While perhaps the most annoying and distracting part of the disorder, it is by no means the only symptom, and since it is not always present, should not be relied upon for self-diagnosis when athlete’s foot is suspected. Instead, look for other telltale symptoms – changes in the skin between the toes, generally the last two toes – in particular, a whitish discoloration, as well as dryness, redness, peeling, blistering, cracking and scaling. Athlete’s foot may also present as redness, scaling or blisters along the sides or soles of the feet. The ‘trademark’ itching may be present in varying degrees, or it may be absent altogether. Pain in the toenail area, often, but not always in the big toe. The nail may appear irregularly shaped and smaller than normal, as though part(s) of it are buried beneath the skin at the outer edges and/or tip of the toe. Pain and tenderness in the area may start as a minor irritation and progress to the point where wearing certain shoes becomes uncomfortable or even intolerable. In some cases, the toe may show excessive swelling, have a discharge around the area, or feel hot to the touch. In this case, infection has set in, and the area needs professional medical attention.Pain in the toenail area, often, but not always in the big toe (hallux). The nail may appear irregularly shaped and smaller than normal, as though part(s) of it are buried beneath the skin at the outer edges and/or tip of the toe. Pain and tenderness in the area may start as a minor irritation and progress to the point where wearing certain shoes becomes uncomfortable or even intolerable. In some cases, the toe may show excessive swelling, have a discharge around the area, or feel hot to the touch. In this case, infection has set in, and the area needs professional medical attention. Corns and callouses are similar, and indeed, the terms are often used interchangeably, although they are not the exactly the same. They do, however, share a common cause in that both are a thickening of the skin in an area that receives extra pressure. They are actually an interesting example of the way our body protects itself; in this case, it builds up hard, dead skin to toughen up an area and prevent it from developing a blister, which can lead to infection. IMPORTANT: If you have diabetes, you should see your podiatric physician at the first sign of any problems with the skin of your feet or toes, no matter how minor you may think they are. Patients with diabetes who develop podiatric problems often require special attention. As an individual who has been diagnosed with diabetes, you are aware that you should take extra precautions to insure your health. These include watching what you eat, monitoring your blood sugar level, and regulating your activity. They also include not taking your feet for granted. Why? 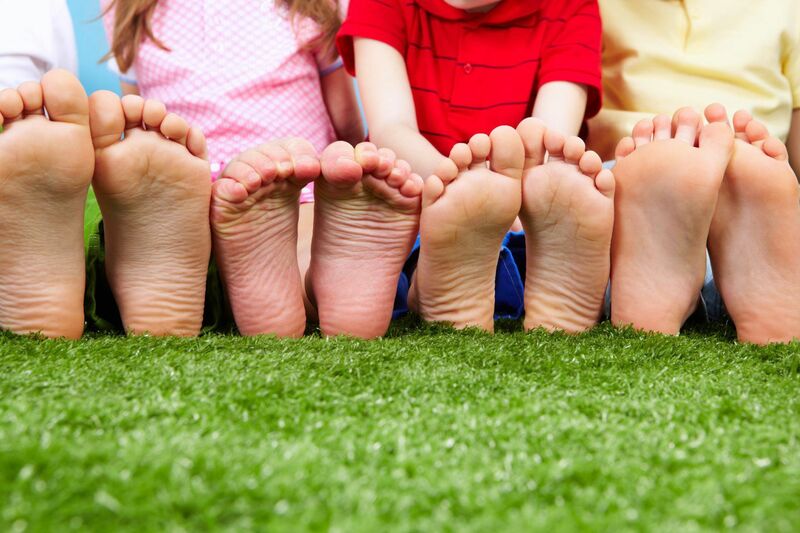 Because feet are a source of potential problems stemming from complications of this disorder. Over time, increased blood sugar levels affect the blood vessels throughout the body. Sugar-based substances line the walls of the smaller vessels and cause them to thicken and as a result, become weaker and less efficient. Fatty deposits clog the arteries (arteriosclerosis), reducing circulation and causing hardening of the arteries as well. When circulation to the legs is decreased, the foot is at much greater risk of injury and infection. A second threat to those who suffer from diabetes is diabetic neuropathy, or damage to the nerves that occurs as a result of the side effects of diabetes. When the nerves of the feet become damaged, they do not function as well in sending messages to the brain about heat, cold, pain, itching, and other sensations and discomforts. This increases the chance of injury, and adds the risk that an undiscovered injury can go untreated, leading to infection – not a good combination with poor circulation. About one in five hospitalizations resulting from diabetes to relates to a foot problem. What to look for: A patient with diabetes should make a habit of checking his or her feet on a regular basis – at least twice a day (morning and evening). It’s also a good idea to check after any vigorous activity, such as aerobic exercise. Try to make a routine, so that you do not forget. Other notes: For the diabetic, no foot injury is minor. Poor circulation can lead to increased risk of infection. Loss of sensation in the feet means a problem may go untreated before it becomes serious. • IMPORTANT: If you have diabetes, you should see your podiatric physician at the first sign of pain or other problems with your legs, ankles, feet or toes, no matter how minor you may think they are. Warts are the manifestation and growth of a contagious virus (HPV, the Human Papillomavirus) that invades the skin through small cuts or abrasions on its surface – even through openings that are too small to be seen with the naked eye. Once inside the skin, the virus can grow and spread, stimulating the rapid generation of cells on the surface of your skin. There are over 60 different strains of HPV. Technically, warts may appear anywhere on the skin, but only those that appear on the soles of the feet are known as plantar warts.Warts are the manifestation and growth of a contagious virus (HPV, the Human Papillomavirus) that invades the skin through small cuts or abrasions on its surface – even through openings that are too small to be seen with the naked eye. Once inside the skin, the virus can grow and spread, stimulating the rapid generation of cells on the surface of your skin. There are over 60 different strains of HPV. Technically, warts may appear anywhere on the skin, but only those that appear on the soles of the feet are known as plantar warts. A stress fracture is a break in a bone. Usually, it is a thin crack that develops over time because of repeated or prolonged forces against that bone. Bones where stress fractures often occur are those in the toes, foot, ankle, tibia or hip. Stress fractures are an injury common to athletes, particularly runners and dancers, or others who practice exercise that involves a repeated impact to a particular bone or joint. A stress fracture starts as a small crack and if left untreated, can worsen until it the bone breaks apart completely. A stress fracture is the result of repeated lesser trauma. To provide an example, if you fell off a ladder, landed hard and broke your leg, that break would be classified as a traditional fracture. If you jogged every day, and over time, the repeated impact caused the bone to crack, that would be a stress fracture. Either way, it’s a painful, debilitating injury. Falling is a hazard that occurs due to decreased muscle mass and strength, vertigo, limb injuries, fatigue and a variety of other health issues. Injuries from a fall can be devastating but can be greatly decreased by using an appropriate mobility aid. There are a variety of ambulation aids available including canes, walkers, scooters and wheelchairs. We do not currently accept medical insurance, including Medicare or Medi-Cal. We can treat Medicare patients, but we cannot bill Medicare for the visit. However, we can provide you with a claim form to submit for reimbursement. We can also provide a claim form for you to submit to your private insurance company as a possible “out of network” reimbursement. Your policy and deductible will determine whether or not your home foot care services are covered. Most medical problems and procedures are at least partially covered by most insurance carriers. **Fees subject to change at any time and discretionary discounts may be applied by doctor. These are for visits only. Other procedures and supplies to be determined at point of care.